This all-steel, adjustable ball mount lets you tow up to 10,000 lbs with the convenience of a 4" drop or 4" rise. Includes 2" and 2-5/16" steel hitch balls, and fits 2" trailer hitches. Call 800-298-8924 to order Andersen ball mounts part number AM3290 or order online at etrailer.com. Free expert support on all Andersen products. Guaranteed Lowest Price and Fastest Shipping for EZ Hitch Adjustable, Steel Ball Mount Kit w/ 2 Hitch Balls - 4" Drop or Rise - 10,000 lbs. Ball Mounts reviews from real customers. Center of hitch pin hole to center of hitch ball: 9-7/8"
Center of hitch pin hole to center of mount holes on shank: 5-1/2"
Center of hitch pin hole to closest point of upright bar weld: 3-1/2"
Center of hitch pin hole to back of shank: 1-1/2"
Tow up to 10,000 lbs with the safety and convenience of the adjustable 4" drop and 4" rise on the EZ Hitch ball mount system. Turn the ball mount over to select a drop or rise. After the ball mount has been installed on your vehicle, just pull the included pin to adjust the combo ball up or down or to flip the combo ball between the 2" or 2-5/16" hitch ball as needed. Replace the pin, and you're ready to tow. The ball mount fits 2" square trailer hitches and is a great solution for those who tow several different trailers. Tow up to 10,000 lbs with supreme safety and the convenience of an adjustable 4" drop and 4" rise with the Rapid Hitch ball mount system. Includes zinc-plated steel ball combo (2" and 2-5/16"). Fits 2" hitches. Stow the ball and mounting platform on this tri-ball ball mount beneath your hitch for a sleek look when you are done towing. Tow up to 3,500 lbs with the 1-7/8" ball, 7,500 lbs with the 2" ball, or 10,000 lbs with the 2-5/16" ball. 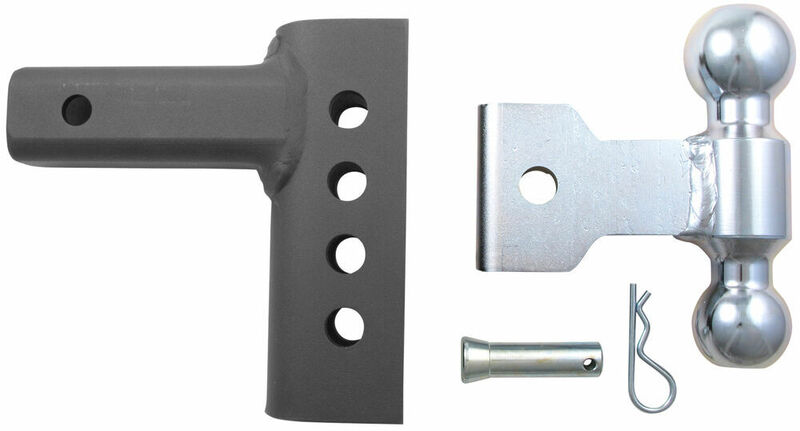 Today, were going to take a look at the EZ Hitch Adjustable Steel Ball Mount Kit Number AM3290. This is an adjustable ball mount with a reversible 2 inch and 2 and 5/16th diameter hitch ball. The two-sided platform has the 2 inch ball and a 2 and 5/16th inches ball on either side. The hitch balls attach to the ball housing with an included pin and clip. The hitch balls or rather the ball mount adjust in 1 inch increments with up to a 4 inch drop and a 4 inch rise with just a pull of a pin and Ill show you how that would work on your hitch mount in just a moment. This kit lets you tow various trailers and keep them level with your vehicle for safer towing and it offers ease of use for a fleet of vehicles with a variety of towing needs. This kit is heavy duty with an all steel construction and its made right here in the US. Now, were going to take out our 2 inch trailer hitch receiver demonstrator. This kit does fit a 2 inch receiver. This is recommended for vehicles and measure 23 inches or less from the ground to the top of the receiver. Opening when the vehicle is level. Again, 2 to 5/16th ball and a 2 inch ball. The 2 inch ball has a gross towing weight of 8,000 pounds. The 2 and 5/16th inches ball has a gross towing weight of 10,000 pounds. Total weight capacity is 1,000 pounds. First, we are going to install the ball mount. Were going to use a pin and clip. This does not come with the item, this particular pin and clip. However, you can get this right here at Etrailer.com Part Number PC3. You pop that in there and just clip that off. Youll know we have this in the drop position. Pull that pin and then wherever you need that to go, well put it down here at the bottom. Flip that off and youre all set. The maximum drop for this item from here to here is 4 inches. The maximum rise is also 4 inches. Ill show you how that would work. Just pop that out. Put that in like so and you got your rise, which again is also 4 inches. Finally, this product does come with a one year limited warranty. That should just about do it for our EZ Hitch Adjustable Steel Ball Mount Kit Number AM3290. Order: RelevanceNewestRating - High to LowRating - Low to High This all-steel, adjustable ball mount lets you tow up to 10,000 lbs with the convenience of a 4" drop or 4" rise. Includes 2" and 2-5/16" steel hitch balls, and fits 2" trailer hitches. The Products are working great! Thank you! It is ideal to have the hitch of the vehicle paired with the level trailer tongue when trailer is loaded. If there is a little bit of a drop toward the hitch ball, that is better than being tongue high. I've attached an article to assist. One of the best ways to ensure you have the best function is to use an adjustable ball mount like # AM3290 to ensure you have the ability to adjust the hitch ball height to best match the level trailer height. The replacement locking pin to replace the pin and clip for # AM3290, is Andersen Trailer Hitch Lock and Adjustment Pin Lock Set # AM3493. This set is made for the specifications of the EZ Hitch Steel Ball Mounts and 2" x 2", oversized 2" x 2", and 2-1/2" x 2-1/2" trailer hitches. I called my contact at Andersen about the flared pin that comes with the EZ Hitch Adjustable, Steel Ball Mount Kit, part # AM3290. They told me the pin is not offered as a separate item and would need to be purchased with the kit. I have attached a link to our product page for the pins we offer. If there is a specific size you need let me know and I will be glad to see if we offer a pin that will work for you. Is The Detail K2 Mighty Multi Utility Trailer Compatible With A 2005 GMC Sierra 1500 Extended Cab? 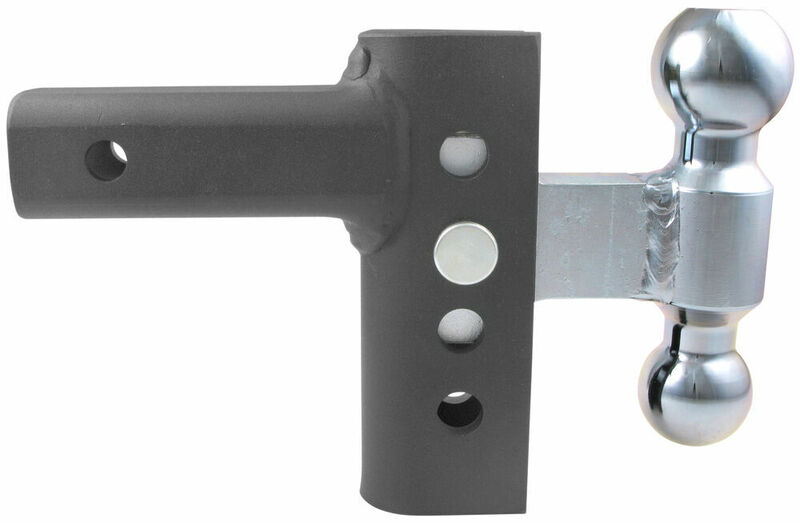 We have the adjustable ball mount # AM3290 which has both a 2 inch and a 2-5/16 inch balls. It also provides up to 4 inches of rise or drop.